TriplePlay is the composing, performing and recording system that puts an unlimited palette of instruments and sounds at your fingertips - all with the freedom of wireless control. Compose music with unparalleled tonal options. Easily share arrangements with your band. Switch between instruments, or play up to four instruments at the same time. Teach or learn faster with accurate notation. Create video soundtracks. Mix your own samples, beats, loops and tracks. The controller's durable, low profile design fits neatly behind your guitar's bridge, and it's wireless, so no heavy 13-pin cables to trip over. The rechargeable Lithium Ion battery has over 20 hours of life - plenty of juice for a full day of composing and a night of gigging. Accessible onboard menu navigation buttons, volume control, and the guitar/mix/synth switch make it easy to change settings or instruments during performances. 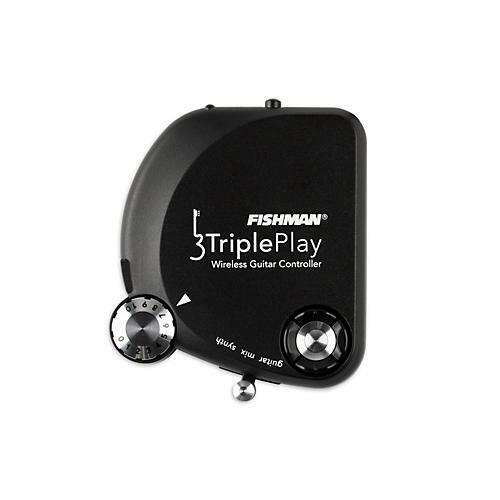 TriplePlay can be installed or removed quickly, on virtually any electric guitar, with no permanent installation necessary. Mounting hardward included. * Performance may vary - North American model only.